The Hill of the Muses, south-west of the Acropolis and with a view that sweeps from the Saronic Gulf to the Argolic Hills, is now known as Philopappou Hill. From here you are almost at eye-level with the Acropolis and you have a breathtaking view of the Parthenon. Below, the city stretches out for miles around, extending to the mountains of Parnitha and Imittos. The monument in memory of the Roman Gaius Ioulius Antiochus Philopappos, a benefactor of the town, was put on the top of the hill in 115 AD. Between the Hill of the Muses and Pnyx there was the Koili (cavity), one of the most densely populated areas of Athens. Access the trails and footpaths of Philopappou from Dionysiou Areopagitou Street. Opposite the tea pavilion and the rustic chapel of Agiou Dimitriou, flagstone footpaths lined with wild flowers wind up through the pine groves. Philopappou is a place to meditate and contemplate the marvels of this grand old city. The downward trail leads to the Pnyx, the meeting place of the Assembly where such great orators as Demosthenes and Themistocles addressed the citizens of Athens. In the evening, you could come here to watch the spectacular sound and light Show on the Acropolis, which told the history of the city. It has not been on since 2000. Beside the Pnyx is Mouseion Hill. Themistocles' long wall ran south from here and commanded the road to the port of Piraeus. Opposite the Pnyx is the Hill of the Nymphs, the site of the Observatory. From 25 May till 25 September you can experience true, down to earth Greek culture in the form of the country's native music and dance. Songs, dances and music which have been in existence for up to two and half thousand years. Not your every day stuff but can you see people doing the Macarena in two thousand years time? The National Greek Dances Theatre Dora Stratou is unique in the world. Founded in 1953, it is the living museum of Greek dance. Songs, music and dances are presented in their original form that were or are still performed in the villages. The costumes are authentic museum pieces, handmade in villages a century ago. The company wardrobe contains 2.500 costumes from all over Greece, complete with jewelry and accessories. On Tuesday to Saturday at 21:30 and on Sunday at 20:15 in the Dora Stratou theatre opposite the Acropolis, in the idyllic surroundings of Philopappou Hill, Greek culture comes to life when 75 dancers, singers and folk musicians, re-enact folk songs and dances. Musical instruments and dancers in authentic costumes offer a wonderful spectacle and illustrate the continuity of ancient Greek traditions. The theatre is situated opposite the Acropolis, on the far side of Philopappou. The 900-seat open-air theatre was built especially for the "Dora Stratou" company. The stage was designed by the famous Greek painter Spyros Vassiliou. The floor is very large in order to allow the free evolution of dancers, just like in a village square or dance-field. Within the theatre area, a hall was also built, used for winter rehearsals, courses and workshops. Tickets: € 15 - No reservations necessary. Program changes every second Tuesday. Performances last approximately 80 minutes, without intermission. Many regions of Greece are represented in each performance. Each region is presented through its authentic dances, costumes, musical instruments and songs. Filming and videotaping are not allowed. Information: 210 3244 395 - Offices: 8, Scholiou - Plaka. Take trolley bus 15 till the "Theatre" stop. 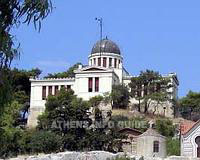 Drive around Philopappou Hill, starting at the "Dionysos" restaurant opposite the Acropolis. There is a spacious parking lot adjacent to the theatre. Photo Dora Stratou and The National Greek Dances Theatre Dora Stratou with kind permission of the Dora Stratou Theatre. The National Observatory is a scientific institute for the study of “heavenly bodies” (we don’t think ours qualifies) and seismology. It is located on Nymphon (Pnyx or Pnika) Hill at a height of 107 meters (351ft) above sea level. Its construction began in 1846 and was completed in 1890. Four institutes are working hand in hand in the National Observatory: the Institute of Astronomy and Astrophysics, the Institute for Environmental Research and Sustainable Development, the Institute of Geodynamics and the Institute for Space Applications and Remote Sensing. The hill of Pnyx is located about 500 meters (1640ft) west of the Acropolis. It is a spacious, semi-circular terrace, artificially leveled out of the rock side, the Bema, with a rostrum for orators. It was here that the early assemblies of the Athenian democracy met. This assembly, the ecclesia, met on average once every nine days and discussed and voted on items brought to it by the town council, the Boulé. Any citizen could speak to an issue and decisions were made by a vote of the majority present. However, 6.000 citizens (all male) were needed for a quorum and sometimes it was necessary to scour the agora, 400 meters to the northeast, in order to recruit citizens to secure the minimum needed for the quorum. This area, exhibiting three building phases, was first used in the early fifth century BC and continued in use at least through the fourth century BC. In the first period, the natural hillside was used as the cavea of the theatre. The surface was evened off by quarrying out the hard limestone, while a straight retaining wall was built on the north side. In the second period, the arrangement of the auditorium was very different; a high, semicircular retaining wall was built to the north, supporting an embankment sloping down to the south, that is, in the opposite direction comparing to the first period. The approach was through the two stairways, 3,90 meter wide. The Pnyx of the third period had exactly the same plan but on a larger scale; the great retaining wall was constructed of large stone blocks quarried from the area, while the new bema was arranged to the south. At some point the ecclesia moved to the more convenient Theatre of Dionysus at the southern foot of the Acropolis. This site is amazing, for a case can be made that this actually was the birthplace of the Athenian democracy as famous Athenian leaders and orators such as Themistocles, Pericles and Demosthenes addressed the assembly here.